We start from a freshly installed Debian/Squeeze (currently stable release) installation. For convenience, install and configure sudo and openssh-server, if you didn't already install these at package-selection time. Debian carries pre-built binary packages of Virtuoso; you have the option of installing Virtuoso using these, or if a newer version is available upstream or you want to specify your own configuration options, you can build from source directly. 0 packages upgraded, 40 newly installed, 0 to remove and 0 not upgraded. Need to get 25.6 MB of archives. After unpacking 69.5 MB will be used. Starting Virtuoso OpenSource Edition 6.1 : virtuoso-opensource-6.1. In accordance with Debian policy that services should start immediately after they've been installed, it creates a default instance based on a configuration file located at /etc/virtuoso-opensource-6.1/virtuoso.ini; the database itself lives in /var/lib/virtuoso-opensource-6.1/db/ (a similar layout to MySQL?, PostgreSQL?, etc.). At this stage you can move on to using Virtuoso through the Conductor web-interface and isql command-line utility, below. Debian have separated-out some of the Virtuoso VAD packages into separate packages of their own. When you install these, all you get is the VAD package on disk ready to be installed via the conductor; Debian does not install the VAD into any running instance for you (because by this time you might have created your own instances elsewhere on different ports). Need to get 13.7 MB of archives. In the conductor (http://localhost:8890/conductor/), go to SysAdmin? / Packages and the iSPARQL, Cartridges and Tutorial and ODS (of which there are several) packages will now be available. There are 2 ways to build Virtuoso from source: using Debian packges or the generic source build that works everywhere. First we install the minimum Debian build environment - basic C compilers and development headers. Need to get 69.4 MB of source archives. update-alternatives: using /usr/bin/sn to provide /usr/bin/cli-sn (strong-name-tool) in auto mode. dpkg-deb: building package `libvirtuoso5.5-cil' in `../libvirtuoso5.5-cil_6.1.2+dfsg1-1_i386.deb'. Selecting previously deselected package virtuoso-minimal. Unfortunately, both unixODBC and Virtuoso provide a command `isql', used to access data-sources from the commandline (in unixODBC, an ODBC DSN; in Virtuoso, the SQL interface). 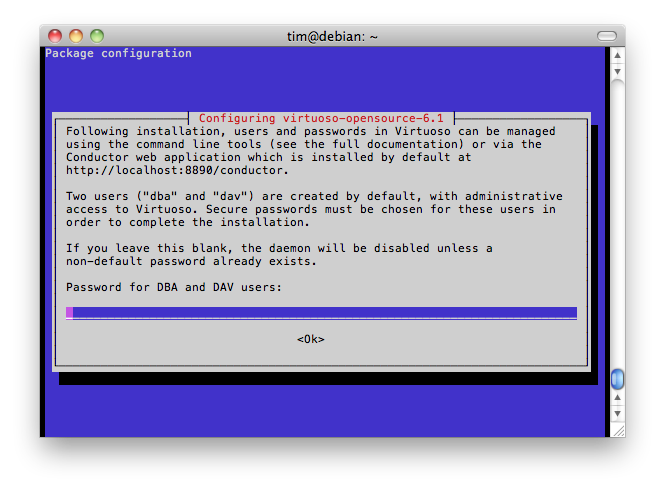 In order to allow both packages to coexist, Debian rename Virtuoso's isql command to isql-vt.